I love getting my kids involved with cooking. It teaches them so many important skills that they will need as they grow up and can help them understand about health and nutrition. We started getting our kids involved in cooking when they were about 2 and they are now really helpful in the kitchen. 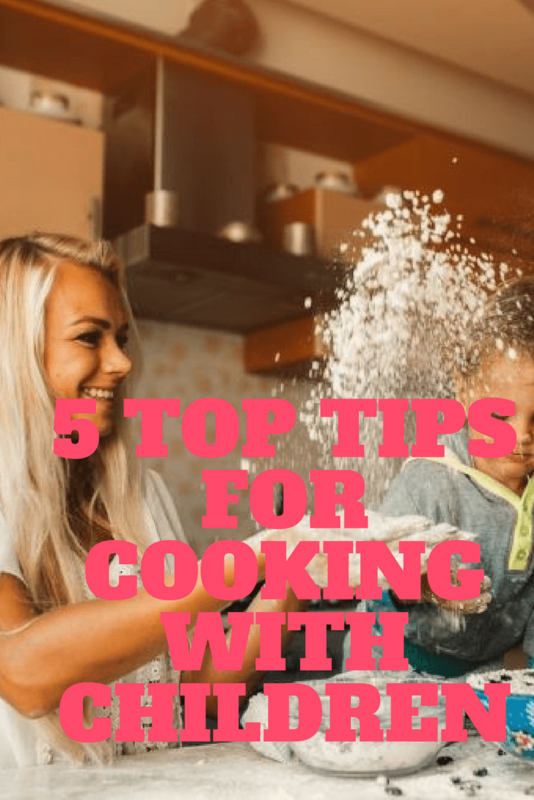 Here are my top 5 tips for cooking with children. If you start off by cooking something that they love to eat they can get really excited about it. When they were little I started off baking with the boys, they would love licking the bowl and eating the cakes at the end. As they’ve grown up we now cook pasta dishes, pizzas and chilli. When we do the weekly shopping I make sure I pick some meals they can get involved in cooking at the weekend, during the week it can be a bit busy after school. Now this does have to be age appropriate but it’s important to let children use knives and other implements when cooking. I’m not saying to let them use the sharpest knife in the house but we need to teach them how to use knives properly. I let the boys use electric whisks, graters and blenders in cooking as well so that they can learn to use them safely. When children are younger it is fun to have an apron and a stable stool that they can stand on to reach the counter top safely. This is so important. Cooking doesn’t need to be a chore and kids love getting involved. If you can make it into a family activity then they will really enjoy it. We had a family pizza making session where the boys made the dough from scratch and got to put on their favourite toppings. Pop over and have a look at our pizza recipe. As well as letting children use the right equipment it’s also important to teach them proper techniques. This means they can cook safely under supervision. When the boys are using the hob or the oven they need to be able to do this safely. Keeping aprons away from the flame, making sure pan handles point the correct way and being careful when they open the oven. It also important to teach them how to use a knife correctly and hold items when you chop them. This doesn’t always have to be in preparing the meal. If I’m making dinner for the kids I’ll ask them to help get the ingredients out, lay the table or clear up afterwards. We incorporate this into the daily routine which helps me out and now the boys can look in the fridge and start making decisions about what healthy meals they would like. They often offer to help peel veg without me asking or ask what else they can help with. 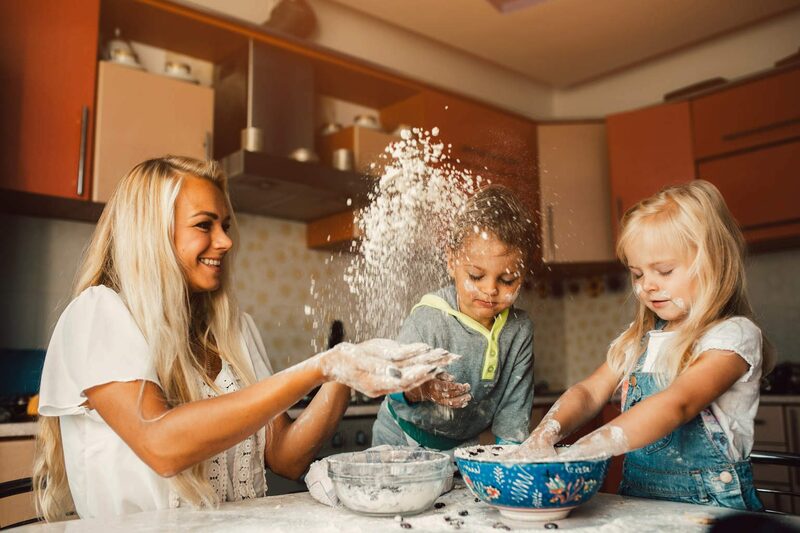 Getting children involved in cooking has so many benefits and I hope these tips will help you get some adventurous cooking going on in your house. Lisa Graham is a family and lifestyle blogger over at www.backsnbumps.com and a mum of three. Sometimes life is chaotic and unpredictable and three spinal surgeries into the mix it certainly makes life interesting. Read her blog BacksnBumps and follow her on Twitter, Facebook and Instagram. The ‘make it fun’ part is key to get them to engage with cooking at that age! Making it fun is the most important part I think. The more fun we have cooking, the more they are willing to eat what we have made, even when it’s not cake!!! Great article! My Mum got me involved with cooking with her from a young age and it certainly helped me be more confident in the kitchen. Not sure my meals taste better because of it but that’s beside the point! This is a great post and I love the picture with the flour being thrown in the air. I let my kids start cooking from when they were toddlers. They also know that I let them lick the bowl and their dad doesn’t because of the risk of raw eggs. Thanks for your sharing. How to teach kids to cook is a good way to help our kids develop the ability to live. I have never allowed my kids to go to the kitchen. I am afraid of knifes hurting them. But now with your sharing above I will let them cook by them-self. This is a new method to teach my kids about the real life.